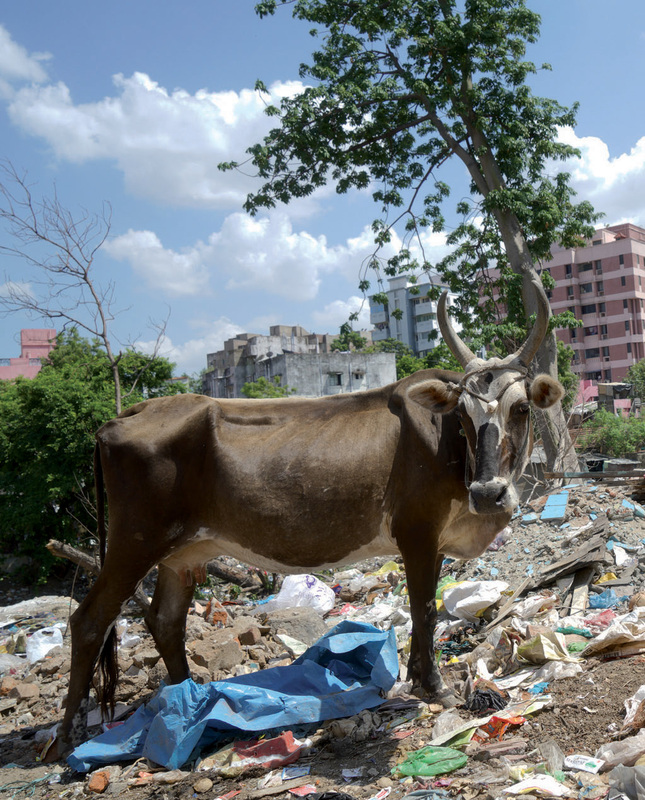 The recovery of post-consumer waste in cities in the developing world is driven by the informal ecosystem. 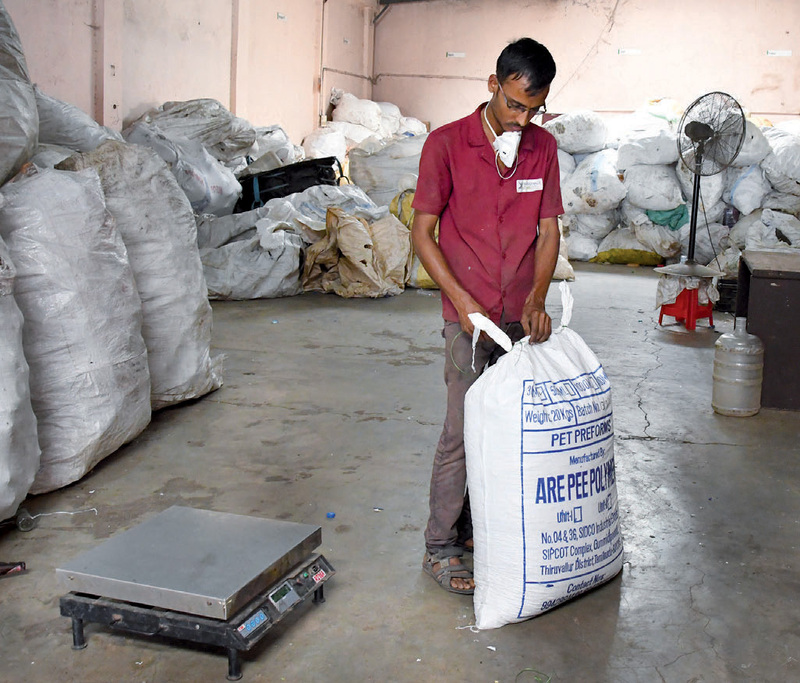 Kabadiwalla Connect, a technology-based social enterprise based in Chennai, has determined that leveraging the informal ecosystem of urban waste recyclers has the potential to decrease the amount of waste sent to landfills in Indian cities by 70 percent. In the current scenario, municipalities, multinational brands, and waste management companies struggle to work effectively with informal stakeholders – despite increasing evidence of the commercial, environmental, and social benefits of forming mutually beneficial partnerships. Through a unique business process and award winning technology, Kabadiwalla Connect integrates the informal ecosystem into the reverse-logistics supply chain, helping municipalities, brands, and waste management companies recover post-consumer waste efficiently and more inclusively in the developing world. Rather than approaching the informality as a problem and developing a new system for waste management, Kabadiwalla Connect uses its technology platform to leverage the already existing informal infrastructure toward a more efficient waste management system. The KC platform makes the informal ecosystem more accessible to other players. Municipalities can utilise informal infrastructure to bring down operational costs; waste management firms can source from it; corporations can carry out their extended producer responsibility through it; apartments and small businesses can send their recyclable waste directly to informal stakeholders that are a part of the informal ecosystem. How did you start working with the informal waste management ecosystem in India? How does the informal waste management ecosystem work? 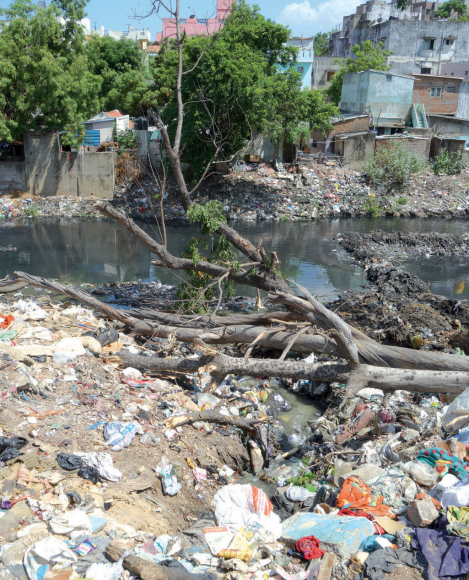 What are the interactions between the formal and the informal waste sectors? 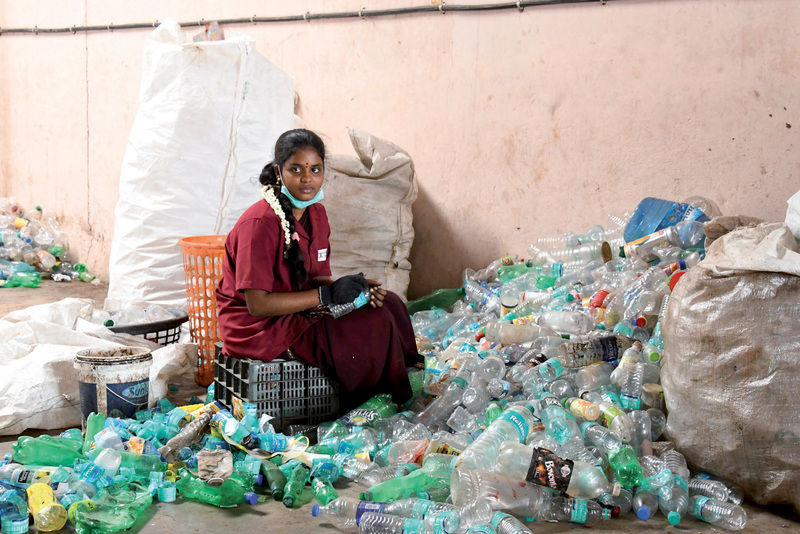 How can Kabadiwalla Connect help informal wastepickers solve developing countries’ recycling problem? What is the social mission of Kabadiwalla Connect? How do you leverage return on experience and support replication? 1While reading about the informality in waste management when I was in the development sector, I realized that studies focused mainly on understanding wastepickers, and that there was very little study of the other actors in the informal supply-chain. Due to this, recommendations on waste management solutions for the developing world were largely based on western models – at most with the recommendation of wastepicker inclusion as a footnote. 2I was very interested in understanding the entire informal waste management ecosystem: Who do wastepickers sell to? What type of material and how much of it can be currently procured in the informal supply-chain? What are the storage practices and prices as material moves up the supply-chain? How does waste find its way from the wastepicker to the final processor? Kabadiwallas were ubiquitous throughout the city. There were close to 2,000 in Chennai. They sourced more than 24 percent of the total recyclable waste in Chennai, which includes paper, plastic, glass and metal. They were making between 20,000 and 30,000 rupees a month (equivalent to a taxi driver), and had been in the business for quite a long time (13 years on average). 52 percent of kabadiwallas owned and operated a smartphone. They were hindered by a lack of visibility, lack of formal integration and information asymmetry. 4Based on this study, we realized that there was a business case here. 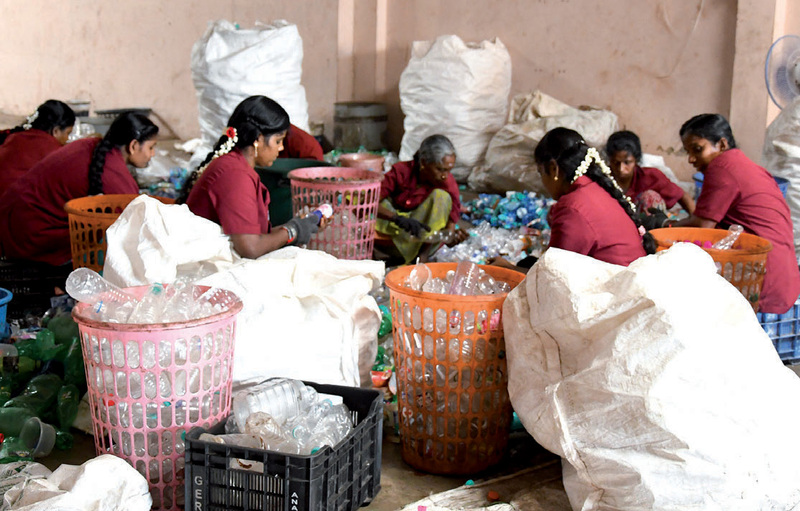 We looked specifically at plastics and realized that there was a big disconnect between the volumes available for recycling and what the kabadiwallas were doing. 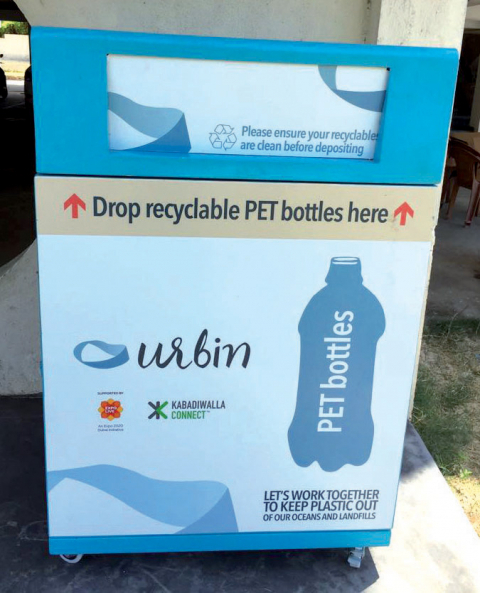 PET seemed to be the most standardized material for recycling but for other types of plastics we were getting mixed signals. We realized that there was a business opportunity in the interface between the informal scrap shops and the formal processing of plastics. We set up a small material recycling facility to procure PET from the informal ecosystem. The main objective was to prove that it was possible to procure consistent volumes from the informal sector and provide certain benefits (better price, better pick up time, clearer signal on the market dynamic of plastics recycling). That is why we have developed a technology-based process that allows us to track the quality and volume of material that we are getting from the informal sector. 5After that, based on our initial research, we won another grant from the Global Partnership For Sustainable Development Data, a global network bringing together governments, the private sector, and civil society organizations dedicated to using the data revolution to achieve the Sustainable Development Goals. The informal sector represents an extremely robust and decentralized supply chain with significant volumes, especially when it comes to paper and metal. When it comes to plastic, the informal sector understands that there is a market but the maturity is yet to come. Therefore, there is a very interesting opportunity here to organize the ecosystem more systematically. Level 0 aggregators: Consist of wastepickers who collect waste material from dustbins or landfills and have no input cost. Sometimes L0 aggregators have a method of transportation like a tricycle (called itinerant buyers), which they use to cover a larger area and collect more waste. At times, L0 aggregators collect directly from the households as well. They have no shop/storage space of their own. Level 1 aggregators: Known colloquially as kabadiwallas, they are small scrap aggregators who own a shop where they collect, store and minimally process waste material collected from L0 aggregators, households, apartments and small businesses. They typically like to set up shop where they can be guaranteed a constant supply of post-consumer waste – either in residential areas, near industries, or near a landfill. They are material agnostic, and typically buy all material that they deem sellable downstream. 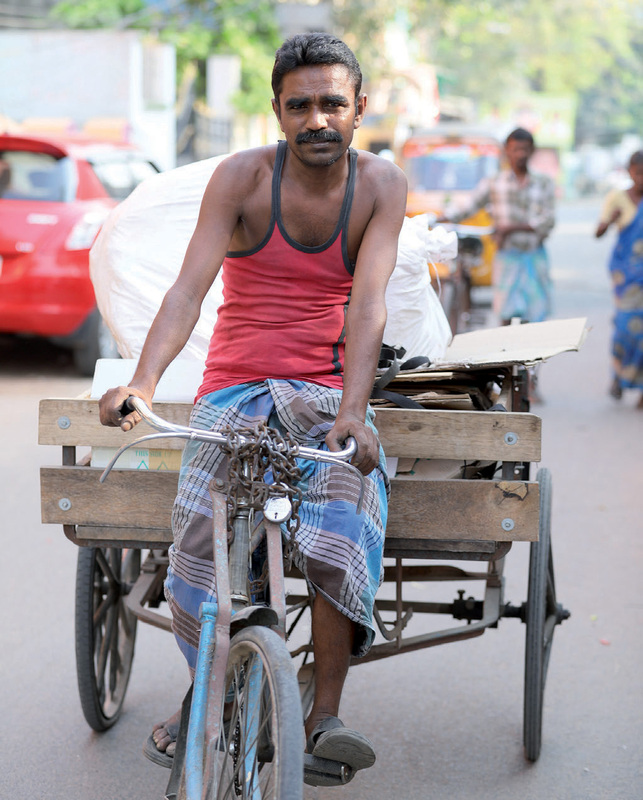 In urban India, kabadiwallas typically buy many types of paper, glass, metal and plastic. They generally sell all the material they collect to an L2 or a larger L1 aggregator in weekly or biweekly cycles. Level 2 aggregators: they primarily buy material from L1 aggregators and bulk generators of recyclable waste. To be viable, they have to be able to store much larger volumes of recyclables, and so favour setting up shop on the periphery of the city. Greater specialisation with regards to material is typically found at the L2 aggregator level, in terms of segregation and/or processing. The outsiders: they are typically informal stakeholders who will never get into the formal sector as they do very low productivity work. The aim is to deliver more equity to these informal workers. They are a mix of L0 and L1 aggregators. The evaders: they earn reasonable revenues but are outside of the marketplace. They are a mix of L1 and L2 aggregators. The avoiders: they earn high revenues and take advantage of the system. They represent L2 aggregators as well as processors. 9Kabadiwalla Connect is interested in knowing more about how the supply chain works so that we can deliver more equity. Our know-how makes us relevant in the policy space to discuss the informal sector and how the private sector and the public sector can harness it. 10It is interesting to think of improving equity through the concept of a “reverse buying club”. Volumes are always key in terms of commanding price. At the moment, only L2 aggregators really understand what price they can make in terms of selling to their clients. They actually extract a lot of value and don’t pass this information upstream, to L1 and L0 aggregators. That is something that we can tackle by providing a better transfer of money upstream. For instance, the producers of PET fibers only buy from large aggregators because they want large volumes. We can work with 20 L1 aggregators and aggregate large volumes and offer a better price to them. 11It is an extremely competitive supply chain: there are large tensions between the informal and the formal waste sectors on sourcing high value plastics and pricing. 12The informal sector, in a decentralized approach, competes very well in this area, despite very poor conditions. Our ambition is to improve these conditions without making them lose their competitive advantage. 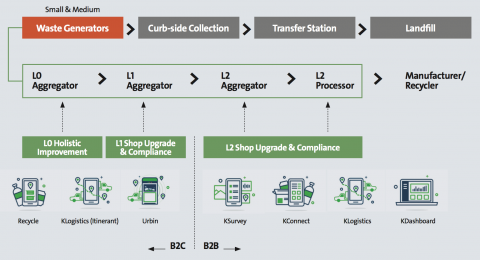 With L2 aggregators, Kabadiwalla Connect works on formalizing – helping them getting some machines, increasing efficiency, establishing transparent and stable pricing. With L0 and L1 aggregators, we focus more on organizing, as they are not keen on formalizing. For example, in our plastics recovery facility, with the L1, we buy their material, we provide them the right receipts, and we take over their tax burden. KC Recover: Technology solutions that help clients recover post-consumer waste cost-effectively – by leveraging the informal sector. 14Our aim is to integrate the informal sector into a reverse logistics supply chain. We are developing technologies – including IoT products – that help L1 and L2 aggregators work together more eﬃciently and provide key metrics to increase traceability. For instance, we have developed an IoT bin. 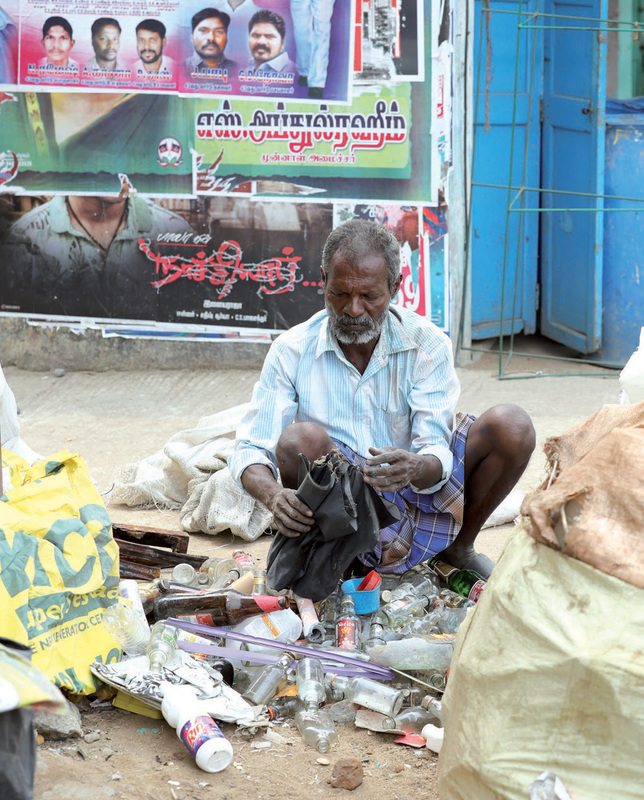 When the bin is full, the kabadiwalla is notified and can pick up the trash from the bin. That helps increase the loyalty of L1 aggregators, improves logistics and reduces costs. We also look at the blockchain as a way of guaranteeing the highest standards of transparency on recycling, especially when considering building a Producer Responsibility Organization (PRO) to handle extended producer responsibility. KC Transform: Solutions that help informal stakeholders create more value from the materials that they source back from the city. 15Our objective is to create more value within the informal supply chain. One of the biggest endeavours that we have undertaken is to build a plastic recovery facility that is optimized to procure from the informal sector. We have one and half years of experience with sourcing PET and we have achieved a high quality on average: 80 to 90 % of PET, thanks to a good sorting. With the partnership with Veolia, we are working on improving the high end transformation and valorisation. 16Kabadiwalla Connect helps integrate informal stakeholders into the formal waste collection and recycling supply chain. Through the KC Recover product suite, we can price for traceability, volume discovery and informal sector integration. Our technology guarantees traceability and volume discovery. 17With KC Transform, what we are trying to do is to build a franchise model for our plastics recovery facility where we are able to work with other L2 aggregators and help them increase their volumes and improve the standards of their shops. 18We are also exploring different options around loyalty: setting up franchises is one of them. We could also build a marketplace around our franchises. We are also thinking of selling some products that are relevant to the informal sector, like this IoT bin that we can sell to a municipality. 19Besides, we also put a social premium on our social impact dimension: improving health and safety standards, upgrading shops, enhancing storage practices, etc. 20The KC platform makes the informal ecosystem more accessible to other players. Municipalities can utilise informal infrastructure to bring down operational costs; waste management firms can source from it; corporations can carry out their extended producer responsibility through it; households and small businesses can send their recyclable waste directly to kabadiwallas that are a part of it. 21Ultimately, we hope to use the solutions from KC Recover and KC Transform to develop a Producer Responsibility Organisation (PRO) for cities in the developing world. 22Rather than approaching informality as a problem and developing a new system for waste management, Kabadiwalla Connect uses its technology platform to leverage already existing informal infrastructure toward a more efficient waste management system. Our social mission is to make sure that there is no one left behind as interest develops in the idea of a circular economy. 23When you think of the kabadiwallas and L2 aggregators, they are entrepreneurial. Our mission is to build the right incentives for this ecosystem because then you are going to see transformation in the lives of L0 aggregators who, at this point, are extremely marginalized. We are trying to develop an ecosystem where L2 aggregators are incentivized to treat L1 aggregators better. For instance, improving their working conditions by providing them gloves. 24There is a real capital crunch among L1 and L2 aggregators that prevents them from generating higher volumes. We are exploring the possibility of providing them with microfinance support. 25I strongly believe that there is a need for South to South learning. Africa, Asia, and Latin America need to learn from each other, understand their differences, and then mitigate them. South to South learning is going to be critical to support growth in developing countries and we need to organize such a two-way conversation that goes beyond the traditional North-South dialogue. 26For instance, from our ongoing field study in Indonesia, we can see that there are ecosystems similar to India. In Indonesia, there are also 3 levels of aggregators but their L1 aggregators are much smaller than in India. It is important that Indonesia and India can learn from each other and increase the replication dynamic. Besides, in the coming years, developed countries might also have to look at the example of the informal waste sector in developing nations as a model for a decentralized and competitive approach. 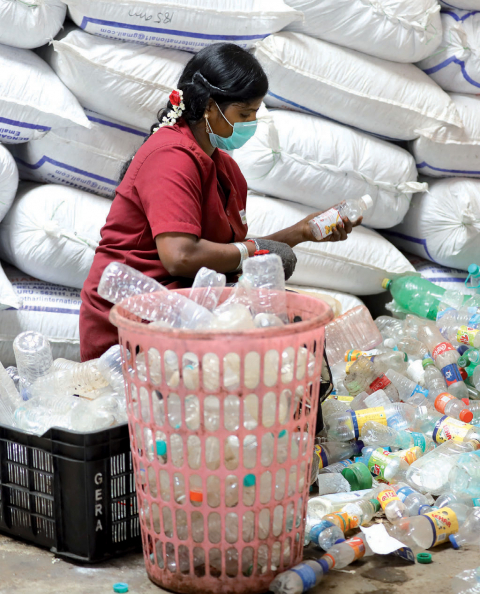 Siddharth Hande, « The informal waste sector: a solution to the recycling problem in developing countries », Field Actions Science Reports, Special Issue 19 | 2019, 28-35. Siddharth Hande is the Founder and CEO of Kabadiwalla Connect, a technology-based social enterprise located in Chennai. Siddharth is a spatial data analyst by training, interested in social entrepreneurship, technology, urban planning, informality and the circular economy in the developing world. Prior to Kabadiwalla Connect, he worked as a consultant for some of India’s premier urban policy and research think tanks, including the Indo-German Centre for Sustainability at IIT-Madras, The Indian Institute for Human Settlements and the Institute for Financial Management and Research.